ages 3-6 | April A-Z Challenge: Picture this! 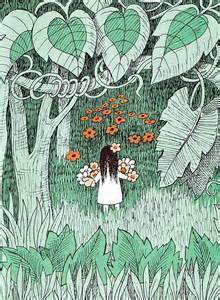 A young girl picking flowers finds herself deep in the forest where a threatening wolf pursues her. She keeps her wits about her and accomplishes a safe return home. We’ll help Little Daughter distract the wolf by singing along with her. Zuiten is a young Japanese boy who helps the monks by sweeping the monastery and working in the kitchen, but he is also clever enough to locate and outwit a magic fox. If your library session includes crafts, the two-character cast of this tale is a good one for making stick puppets or finger puppets. The Limba people of Sierra Leon tell this tale of a little mouse who saves herself by following her father’s advice: when you are out and about, use your eyes and your ears–and if you must move, move quickly! We’ll play the Cat Society game as we tell the tale–and maybe again afterwards! Kate Seredy’s illustration for The Gunniwolf (1936) by Wilhelmina Harper.